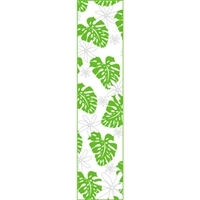 Monstera Nui Green Treat Bags - Wine. 12 bags with silver extra long twist ties. Green Monstera Leaves with White Tiare Blossoms on Clear. Each bag measures approximately 4" wide x 18" tall x 2.5" side gussets. Bag is only decorative. Bottles should be carried by the neck or bottom. Monstera Nui Gold Treat Bags - Wine. 12 bags with silver extra long twist ties. Gold Monstera Leaves with White Tiare Blossoms on Clear. Bag is only decorative. Bottles should be carried by the neck or bottom. Laua`e Treat Bags - Wine. 12 bags with silver extra long twist ties. Bag is only decorative. Bottles should be carried by the neck or bottom.